CUMBERLAND LINCOLN EDITION | VALLEY BREEZE | NOVEMBER 8-14, 2018 SPORTS & RECREATION 33 He's such a low-key guy who's never in the forefront. Even when I look for pictures of the Happy Basket (volun- teers), he has everyone else in it and there's no pictures of him. He's that type of guy. He grew up and coached at the Boys Club, and he's very proud of his time with the Tigers' baseball team at the club." Johnson has also served as the pho- tographer for the past six Night of Legends ceremonies, "and this year, we told him he can't take a night off, even though he's being honored," Walsh added with a laugh. "He still has to do the photography." In the team category, the Roadshow chose to honor three CHS teams who are celebrating the anniversaries of their magical seasons: the 1968 state championship baseball team, 1977-78 boys' basketball team, and 2007-08 boys' hockey team that won the Division II championship. The baseball team, which repeated as Northern Division regular-season champions with a 13-3 mark, captured its program's second state title (and first since 1962) by winning three pitchers' duels in the postseason. The Clippers nipped Pilgrim in the quar- terfinals, 1-0, edged North Kingstown in the semifinals, 2-0, and took a memorable 2-0 thriller from Central in the finals. "In the championship game, John LaRose, who was a junior and went on the pitch for the Boston Red Sox (in 1978), pitched a no-hitter," said Walsh. "And Brad Dean, who was a senior, hit a run-scoring triple in the eighth inning to give Cumberland a 1-0 lead. He drove in Tom O'Connor, who went on to play baseball at Notre Dame and was (Washington Redskins quarterback) Joe Theismann's room- mate for four years." The boys' basketball team didn't win any championships during the 1977-78 campaign, but the Clippers grabbed the community's attention by playing in the state's Final Four that winter. After a long run in Division II, Cumberland was promoted to the state's top division in the 1970-71 sea- son and had its share of struggles for most of the decade. But in the 1977- 78 season, the Clippers rolled out a talented team that not only went 13-5 during the regular season, but also beat Our Lady of Providence in the state tourney's quarterfinals to reach the semis for a showdown against mighty Central. The Knights defeated the Clippers, 67-53, and went on to win its eighth state championship in the last 10 years. "That team was led by two seniors, Dave Sweat and John Straight," added Walsh. "John had broken a bone in his hand and missed a large part of the season, but came back in the play- offs and had a great tournament. Joe Hughes was the head coach and John McVeigh was the assistant, and they had four other senior stars, Thom Crooks, Armand Joly, Bob McBride, and Paul Orsini." As for the hockey team, the Clippers won its first Division II championship in 19 seasons by fol- lowing up a superb regular season – the Clippers posted a 13-2-1 record that was a point behind first-place Portsmouth – with a magical run in the playoffs. Not only did Cumberland defeat defending champion Smithfield in three action-packed games in their best-of-three semifinal-round series (and take the third and deciding game in overtime), but the Clippers went on to blast St. Raphael Academy in the best-of-three finals at Providence College by scores of 8-2 and 5-3. "The freshmen who played for Mark Andreozzi in his first season as the head coach were the seniors on that team," noted Walsh. "Mark did a lot of things to help build the pro- gram, and these freshmen were the fruits of that as seniors." Tickets for next week's event are $30 each and available at the Boys & Girls Club on James McKee Way or at The Dugout on the night of the event. A buffet dinner will be served, and tables for honorees will be reserved for family and friends attending. 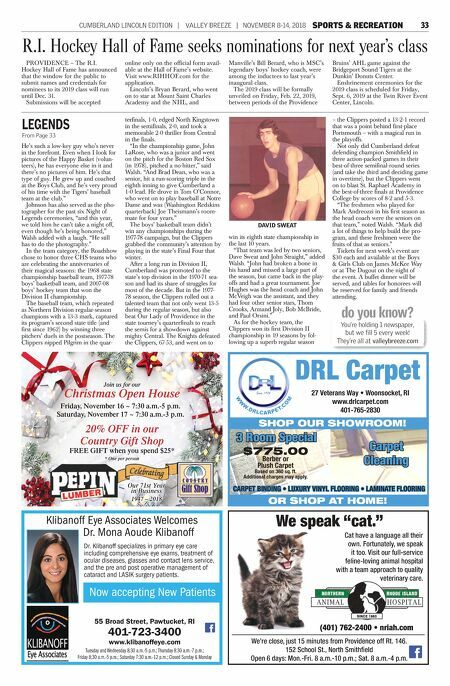 LEGENDS From Page 33 DAVID SWEAT R.I. Hockey Hall of Fame seeks nominations for next year's class PROVIDENCE – The R.I. Hockey Hall of Fame has announced that the window for the public to submit names and credentials for nominees to its 2019 class will run until Dec. 31. Submissions will be accepted online only on the official form avail- able at the Hall of Fame's website. Visit www.RIHHOF.com for the application. Lincoln's Bryan Berard, who went on to star at Mount Saint Charles Academy and the NHL, and Manville's Bill Berard, who is MSC's legendary boys' hockey coach, were among the inductees to last year's inaugural class. The 2019 class will be formally unveiled on Friday, Feb. 22, 2019, between periods of the Providence Bruins' AHL game against the Bridgeport Sound Tigers at the Dunkin' Donuts Center. Enshrinement ceremonies for the 2019 class is scheduled for Friday, Sept. 6, 2019 at the Twin River Event Center, Lincoln. do you know? You're holding 1 newspaper, but we fi ll 5 every week! 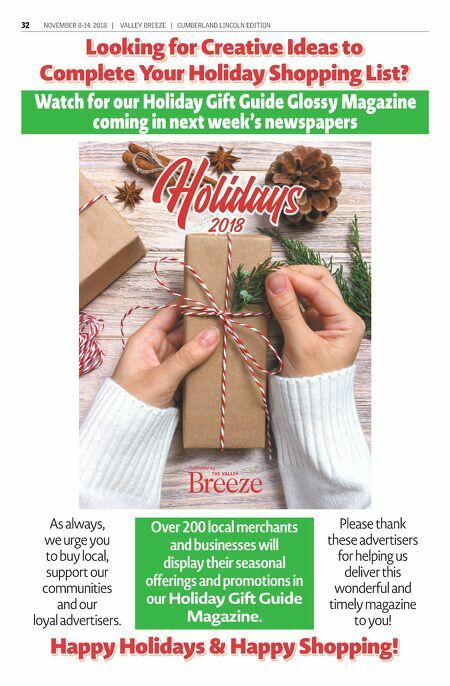 They're all at valleybreeze.com Our 71st Year in Business 1947 – 2018 Join us for our Christmas Open House Friday, November 16 ~ 7:30 a.m.-5 p.m. Saturday, November 17 ~ 7:30 a.m.-3 p.m. 20% OFF in our Country Gift Shop FREE GIFT when you spend $25* * One per person We're close, just 15 minutes from Providence off Rt. 146. 152 School St., North Smithfield Open 6 days: Mon.-Fri. 8 a.m.-10 p.m.; Sat. 8 a.m.-4 p.m. We speak "cat." (401) 762-2400 • nriah.com Cat have a language all their own. Fortunately, we speak it too. Visit our full-service feline-loving animal hospital with a team approach to quality veterinary care. Klibanoff Eye Associates Welcomes Dr. Mona Aoude Klibanoff Now accepting New Patients 55 Broad Street, Pawtucket, RI 401-723-3400 www.klibanoffeye.com Dr. Klibanoff specializes in primary eye care including comprehensive eye exams, treatment of ocular diseases, glasses and contact lens service, and the pre and post operative management of cataract and LASIK surgery patients. Tuesday and Wednesday 8:30 a.m.-5 p.m.; Thursday 8:30 a.m.-7 p.m.; Friday 8:30 a.m.-5 p.m.; Saturday 7:30 a.m.-12 p.m.; Closed Sunday & Monday DRL Carpet 27 Veterans Way • Woonsocket, RI www.drlcarpet.com 401-765-2830 SHOP OUR SHOWROOM! 3 Room Special $775.00 Berber or Plush Carpet Based on 360 sq. ft. Additional charges may apply. Carpet Cleaning CARPET BINDING • LUXURY VINYL FLOORING • LAMINATE FLOORING OR SHOP AT HOME!